It’s Fundamental Surgery’s unique combination of SHIE ™ technology with VR simulation that generates maximum immersion. FundamentalVR, pioneers of immersive training technology for the medical community, today launched Fundamental Surgery, a first-of-its-kind SaaS software platform that combines virtual reality (VR) with cutting-edge haptics (the sense of touch) to create a low-cost and scalable flight simulator experience for trainee and qualified surgeons. Unlike other medical training simulations that make professionals feel like they have been through a game-like experience, Fundamental Surgery creates an authentic environment that allows users to experience and navigate the same visuals, sounds and feelings they would during a real surgical procedure. At the heart of the system is its unique Surgical Haptic Intelligence EngineTM (SHIETM), which is calibrated to mimic real life sensations of numerous medical tools and tissue variants. By combining immersive haptic technology with low cost, off-the-shelf hardware, Fundamental Surgery is democratizing surgical simulation through plug-and-play simplicity and a hitherto unachievable price point – less than a cost of one cadaver. Designed to improve patient outcomes while combating the increasing cost of medical training that tops $15 billion annually in the U.S., Fundamental Surgery was created by a team of VR, haptic specialists and surgical training experts and has been extensively tested by over 500 surgeons. Its initial U.S. offering will focus on training packages within the Orthopedic Surgical disciplines. Available to order today, current procedures supported include Spinal Pedicle Screw Placement, Posterior Hip Replacement and Total Knee Arthroplasty. Further orthopedic procedures will be added during Q4 2018 with other disciplines, including general surgery and cardiovascular slated for 2019. Despite the massive advancements in science and medical technology, the way surgeons are trained has remained largely unchanged for the past 150 years. Typically, this consists of classroom-based theory, theatre-style viewing of cadaver-based teaching, observation in the operating room (generally far removed from the actual procedure), hands-on cadaver practice (expensive, limited use), closely monitored live patient involvement and increasingly YouTube. The introduction of simulations to supplement learning is a recent development. However, current solutions either require special, static machinery that cost $100K+ or provide a game-like experience with no sense of touch. This means only 0.5% of the world’s surgeons have access to simulations. For the cost of just one cadaver, hospitals and medical training facilities across the country can now offer realistic training experiences for surgeons to hone their skills anywhere at any time. Fundamental Surgery eliminates the need for complex and expensive training systems. The software is hardware agnostic and works in conjunction with any modern PC or laptop, a standard VR headset and two haptic arm devices ­– all of which are widely available for purchase. While other simulations are limited to visual and audio interactions, Fundamental Surgery takes it to a new level with SHIETM, its proprietary technology that adds a real-time sense of touch. Users can feel the movement and interaction of tissue, muscle and bone as they would in an actual procedure within a submillimeter of accuracy of resistance. SHIETM contains a library of tools and tissue variants that mimic real life sensations that have been calibrated by a leading team of surgeons and KOLs. SHIETM continually adapts with feedback and is designed to work with new haptic devices such as new arms and gloves as they become commercially available at low cost. During each simulation, users will be able to assess and measure performances and receive real-time feedback on instrument use and techniques (including pedicle probe, x-ray and sagittal saw), procedural accuracy and patient impact. This information will also be able to be stored for both the user and the admin control, allowing changes in competency to be tracked, so progress and areas for refinement can be identified. In addition, the system will be able to be programed to present users with branched outcomes – rare complications or scenarios that can happen during live procedures such as unexpected bleeding, abnormal anatomy or a change in a patient’s condition. Just as pilots train for bird strikes or engine failure, this capability better prepares the surgeon and facilitates better patient outcomes. This unique feature can be selected or randomized to reflect life’s events. Fundamental Surgery’s orthopedic simulation experiences are now available in the United States, with introductory prices starting at just $350 a month. For more information, please visit: www.fundamentalsurgery.com. FundamentalVR is a technology company specialising in immersive experiences to enhance medical training. It has developed Fundamental Surgery as a SaaS platform featuring VR Haptics technology that takes advantage of readily available virtual reality hardware to create a simulation system that can be used on any modern PC set up – even a laptop. Fundamental Surgery gives healthcare professionals around the world access to authentic surgical simulations at low cost. 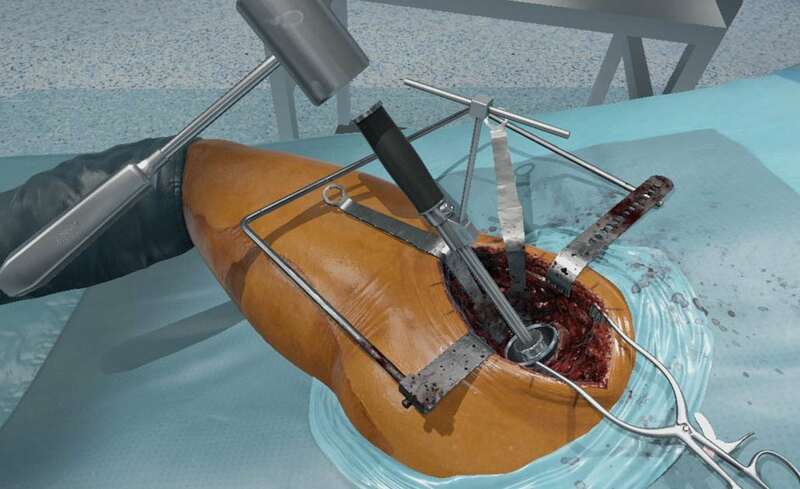 https://www.fundamentalsurgery.com/wp-content/uploads/2018/08/Haptics-for-Humanity-FUNDAMENTAL-SURGERY-launches-in-the-US-Surgical-simulation-VR-virtual-reality-health-medicalfeaturedimage1200x1200.jpg 1200 1200 Annabelle Miles https://www.fundamentalsurgery.com/wp-content/uploads/2018/03/fsvr-logo-300x138.png Annabelle Miles2018-08-14 16:17:582019-02-11 16:02:35HAPTICS FOR HUMANITY - Fundamental Surgery launches in the U.S.